Please click on the links below to download annual reports on local Dragonflies and Orchids by John Ward-Smith. Also, past BDUWG Newsletters which contain features such as Nature Notes by David Lloyd and articles on a wide variety of topics affecting our local wildlife. Report by John Ward-Smith, updated Jan 2015. Summary report by John Ward-Smith, August 2014. Summary report by John Ward-Smith, updated Dec 2013. An Overview for the Period 1993-2012 by John Ward-Smith. Management of Grass Banks. 2011 Dragonfly season in Bracknell Forest Borough. Dragonflies. 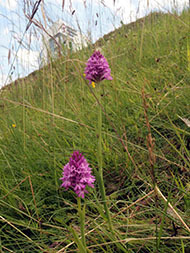 Bracknell's Wild Orchids. Butterflies. Moths. Swinley Forest Fires. Dragonflies. Moths in Forest Park. Winter weather attracts unusual visitors to Berkshire. Comments on BFC Site Allocation DPD Document. Peter Williams RIP. Christmas on Lundy.